So, on my way to Whole Foods tonight to pick up some food supplies while I’m at this conference, I learned all about Egyptian food from my Egyptian Lyft driver. He went on for 10 minutes straight! I love talking to recent immigrants about food. They are so passionate about it! I even recorded him explaining his favorite Egyptian dishes, but I’m having trouble uploading it, so I’ll just say this … it sounds Mediterranean, but it’s got it’s own spin. Lots of lamb, onions, garlic, spices, and tomatoes. On the way back, I took a ride with a Lyft driver from Nigeria. He talked about plantains and spicy, spicy food. He said he goes to an African market in Dallas to get groceries to cook with, and often visits an African restaurant when he’s busy. But … he said his favorite American food is …. chicken. What kind of chicken, exactly? Fried chicken. And wings! He waxed poetic about chicken for several minutes. You can learn a lot about food by taking a Lyft. There are two things to remember when you go to Vegas. First, bring your walking shoes. You’ll walk more than you walk anywhere. Including New York City. Second, nothing is easy to find. The signage is almost deliberately confusing. My theory Is the owners of the casinos want you to get lost, tired, and finally sit down at a slot machine and feed it all your money. All of these things (except the slot machine bit) happened to me today, and I was only in Vegas for 3 hours! It was a layover on my way to Dallas. But, here’s the thing about taking a discount airline: Expect the unexpected. I did a hacker fare to go to Dallas, and it routed me through three airlines, and two stops. I checked in a normal carry-on bag (because it was cheaper than paying the extra to put it on the plane), and then picked it up between flights in Vegas. It arrived in Terminal 1. My next flight was in Terminal 3. After asking for directions to the airline check-in counter three times, I finally found the right shuttle to take me to Terminal 3. I got to Terminal 3, found the ticket counter, re-checked my bag, stood in line for security, and then took a train to my gate. By the time arrived at my gate I had spent 2 of my 3 hour layover. The good news is that I got 7,000 steps in on my Fitbit. 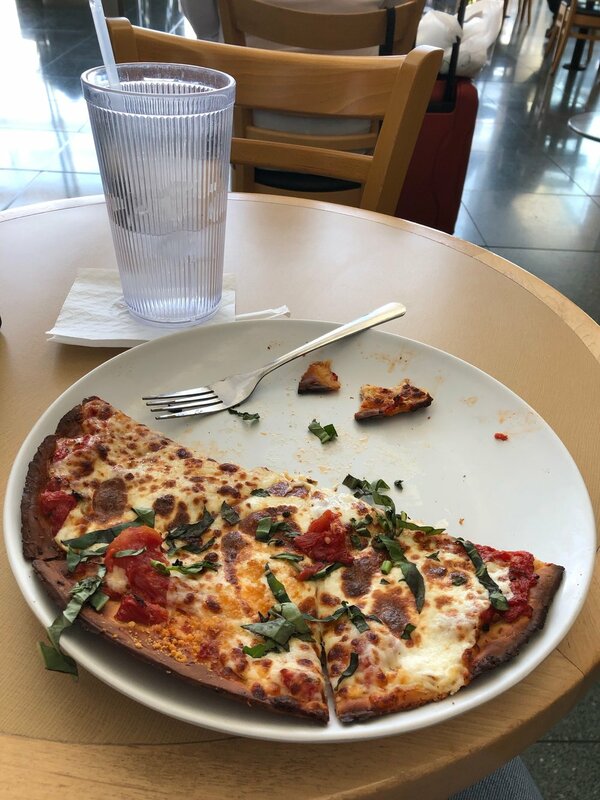 And the other piece of good news is that I had just enough time to stop at California Pizza Kitchen and get this delectable Margherita pizza with a gluten-free cauliflower crust to tide me over for both a late lunch and dinner. And now I’m at my hotel in Dallas, about ready to hit the hay.